Not everyone was pleased with the environmental review this time around. 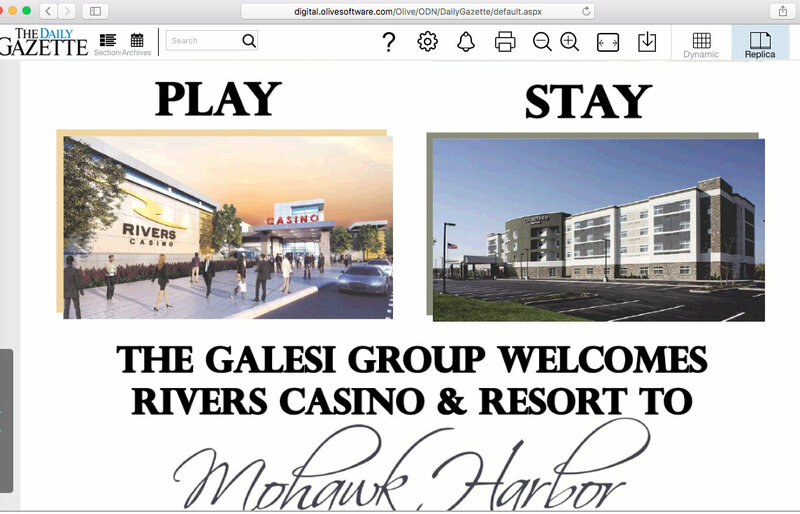 David Giacalone, a resident of the nearby Stockade neighborhood and an outspoken opponent of the proposed casino, sent an email to Gillen about 15 minutes before the board vote was to be held Wednesday asking the board to delay its final approval. 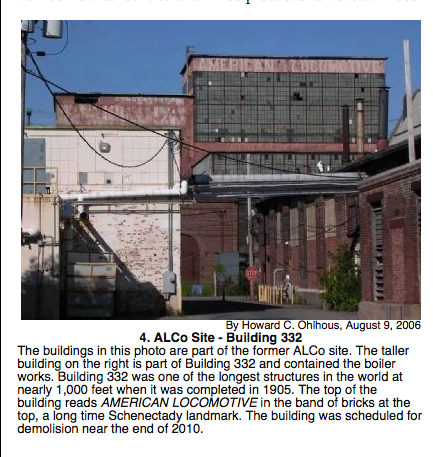 Attached was a letter addressed to the board of directors from himself and local landlord Mohamed Hafez calling for an investigation of tunnels that were allegedly discovered during remediation beneath Building 332 at the Alco site. The tunnels, they said, were discovered in August and removed, but were not addressed in the updated environmental review of the site. Giacalone showed up to Wednesday’s board vote, but arrived too late to make any comments during the public comment period. As stated above in our proposed op/ed Letter to the Editor, none of our supporting information was provided in the article. Not only did Ms. Bump, the reporter, receive our email to Mr. Gillen with our Memorandum at the time it was sent to Metroplex, she spent perhaps half an hour discussing the issues and facts with me directly after the Metroplex meeting on October 22. She knew I had only received the tip on the tunnel and coverup two days prior and verified it one day before the Metroplex meeting. She also knew that I was late to the Metroplex meeting because of the lack of parking spaces due to a big show at Proctor’s and because a building guard sent me to the wrong set of elevators, at the opposite end of the building. Also, regarding my late arrival: The public comment portion of the meeting was in fact continuing as I entered, but when Chairman Gillen looked to me to see if I wanted to say anything, I shook my head no, because I had submitted my comments in writing. More important, although I was about 15 minutes late for the start of the meeting, the Metroplex Board had already voted on its annual budget and approved the Mohawk Harbor SEQRA environmental report in the short period before I arrived, prior to offering its brief public comment period. In our discussion after the Metroplex meeting, Bethany Bump voiced her dismay that the Gazette would agree not to cover the story when asked in August. She also said she did not plan on mentioning the tunnel issue in her article that evening, because her editor would want her to check out my sources before reporting on my claims. Ms. Bump also told me it was too bad Don Rittner was a former City and County historian and not still in that position. When I saw the article online later that evening, I was surprised that they had nonetheless raised the tunnel issue. Ms. Bump replied to a tongue-in-cheek email from me late that evening asking who “this kook Giacalone” is by explaining that her editor decided they would report on the tunnel issue, because I had submitted a letter about it to Metroplex that was on the public record. Buicko and Gillen have both disputed the allegations. They said the “tunnels” were actually pipe chases — a concrete encasing that protects and conceals underground infrastructure such as water or electrical pipes. They had no historical or archaeological value, they said. They were removed and filled in, they said, so the ground would not collapse under future development. The state Department of Environmental Conservation has overseen remediation of the site as part of its brownfield program, and could not answer specific questions this week regarding the discovery. A spokesman said it’s not unusual to find such infrastructure at a cleanup site. “All of the items uncovered by excavation were as anticipated from the site records and do not consist of any archaeological or historical properties,” said Daniel R. Hershberg, a partner at Albany firm Hershberg & Hershberg who has served as a civil consultant on the project, in a letter. Rifenburg Contracting Corporation, a Troy-based contractor that’s working on the site, and Barton & Loguidice, an Albany firm providing environmental consulting services, also wrote letters with similar findings. “To my knowledge, the utility corridors that have been removed were intended for allowing access for operation and/or maintenance activities, and were not passageways or tunnels,” said Andrew J. Barber, a senior environmental consultant with Barton & Loguidice, in a letter. 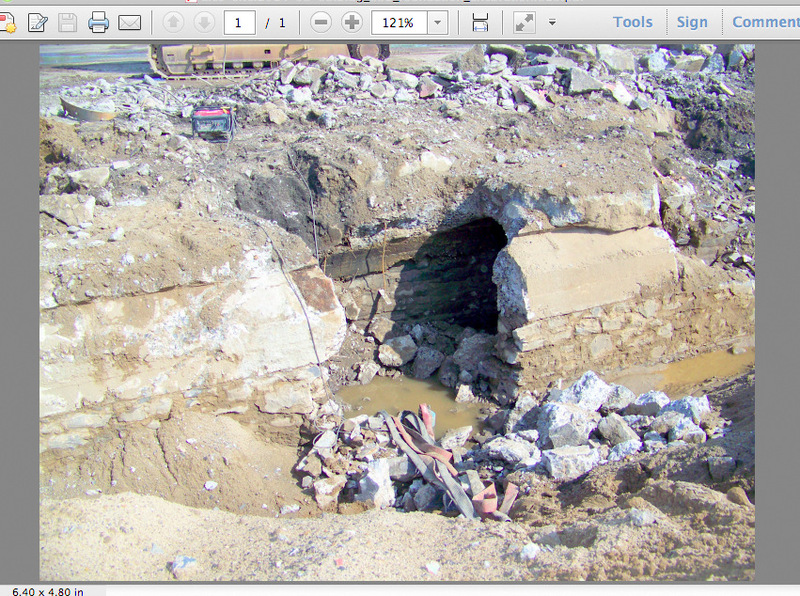 The removal was necessary, he said, to provide appropriate “geotechnical” stability for future buildings at the site. During our conversation after the Metroplex Meeting, Ms. Bump and I discussed the apparent bias of the Gazette newsroom editors in favor of the casino. When I mentioned the front page article on Sunday August 3, 2014 [“Schenectady Casino Group Praised“, by Haley Vicarro,], Bethany instantly and animatedly said that when she went in to the Gazette newsroom the next day she pointedly asked how they could put a Rush Street Gaming press release on the front of the Sunday Gazette. She also asked why they needed to repeat a topic she had covered herself in a (balanced) article in June [see “Officials in other cities warn of pitfalls, failed promises by Rush Street“, June 8, 2014, by Bethany Bump; and see our posting “a few things the Gazette forgot to mention“]. By the way, although the Gazette could not be bothered to focus on our reasons for a delay in the SEQRA review process to clarify the tunnel issue with even a sentence of explanation, it had no problem publishing a 600-word article on November 19, 2014 trumpeting that “Howe Caverns environmental review questioned” (by Matthew McKibben), based on the allegations in a lawsuit filed by an opponent of that casino. Is there a difference that would justify coverage of the allegations in a petition starting a lawsuit? One big difference is that filing a lawsuit questioning and therefore perhaps slowing down the finalizing of the Howe Caverns environmental review might lessen its chance of being selected by the Location Board, which increases the odds that the Schenectady casino application will be selected. I will let you know what I find out, no matter which way the facts seem to cut. Exactly. These conduits/pipes/tunnels/whatever could very well be perfectly innocent, but now I’ve heard from at least one other person that was asked not to talk about them. If they’re so innocent, why can’t anyone talk about them? I’ve just been busy. But yes I am still looking into them. One of the holdups has been the state agencies. DEC finally got back to me the other day. Still waiting on SHPO. That was the last communication from Bethany on this or any other topic. On Nov. 14, 2014, I sent the above op/Ed Letter above to the Gazette Opinion staff and to Mark Mahoney, Editorial Page Editor. For perhaps two decades, the Gazette has published every opEd piece I have proposed to them, as well as my letters to the editor. Former Editorial Page Editor Art Clayman and his successor, Mr. Mahoney, have always replied quickly, at times with a phone call. When I heard nothing about the ACLO coverup piece, I wrote again to Mark Mahoney on November 20th, asking “Are you planning to use the piece I sent you a week ago about the “tunnels” uncovered and covered-up at the ALCO site?” Again, there was no response of any kind. Therefore, I have decided to “publish” the piece myself here at “stop the Schenectady casino.” The Gazette‘s actions and failures on this issue are not important solely on the casino question, but raise questions about its integrity that will linger as long as it attempts to fill the role of Schenectady’s “Newspaper of Record”, and is an important actor in our community’s public and political life. As we wrote in the Letter to the Editor above and in our Comments on the issue to the Location Board, we will never know whether the tunnels were standard, mundane utility corridors, or were indeed of archeological and historical significance. We will never know, because the Applicant concealed their existence from all but DEC’s remediation engineer, demolished them and filled them over, and both the Gazette and Metroplex let them get away with it. I am still optimistic that the NYS Gaming Facility Location Board will give full consideration to the information we have submitted to them about the Schenectady Casino application, as well as to the opinions of other opponents. If the Board carefully evaluates the credible evidence and compares it will the statutory standards it is tasked to apply, we feel confident that the Board will choose an applicant other than Schenectady’s Rivers Casino at Mohawk Harbor. click here to see our Memorandum to Metroplex about the ALCO tunnels, Oct. 22, 2014. This entry was posted in news & press, punditry/viewpoint, Schenectady Casino and tagged Metroplex, Rush Street Gaming, Schenectady Casino by David Giacalone. Bookmark the permalink.